City Fit Shop is the only place in the city you can come practice you Ninja Warrior / Obstacle Course Skills! 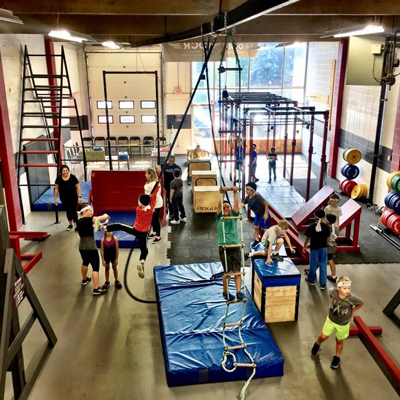 Our Obstacle Open Gym night is for all ages and abilities. It is great way for your family and/or friends to spend time together! This is a not a playground, but a venue to practice challenging, exciting, and fun obstacles. ACTIVE SUPERVISION is required for all kids under the age of 14. Parents are required to spot and assist their children as necessary. This is necessary due to the nature of City Fit Shop being a gym and not a playground or playplace. SAFETY is our NUMBER 1 priority. Parents/guardians are not required to purchase a ticket if they are supervising only. Children under the age of 6 are free with an Adult Drop-In. Please sign in to Open Gym using your membership at Mindbody Online. Copyright © 2017 City Fit Shop Inc. | cityfitshop.com | All rights reserved.